Ever wish you could get a 360-degree look at what your block looked like before that community garden was planted? Or wish you could give your newer neighbors a glimpse of the overgrown vacant lot that, after years of hard work, has become the pride of the block? Thanks to Google, you can do just that. Now, when you search for an address using Google Street View, you can toggle back and forth between past and present. 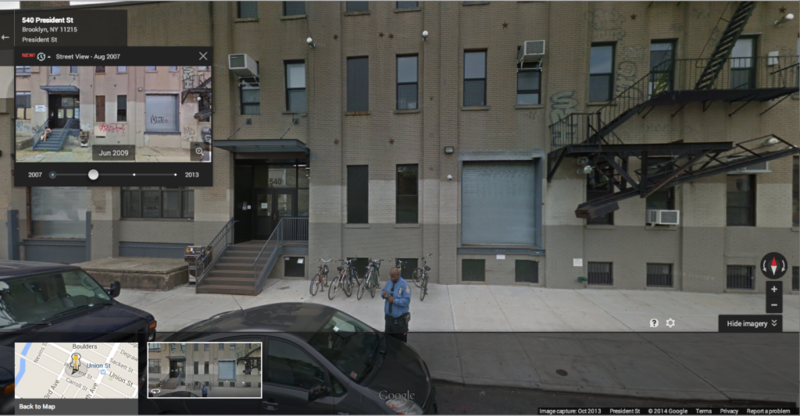 Here’s the front of the ioby office in 2013 and in the upper left hand corner you can see it in Aug 2007. The Moore family, some of our most prolific ioby Leaders, sent us this incredible series of snapshots. Capturing the same site in Indianapolis three times between 2007 and 2013, the Google van documented the destruction of an industrial building, the vacant lot left in its wake, and the birth of Fall Creek Gardens. A great example of a crowd-resourced placemaking project, the iconic sunflower mural in this garden was entirely funded by neighbors on ioby. This is more than just an interesting “before-and-after.” We think that this is a powerful illustration of the restorative and creative power of community investment. We know that crowd-resourcing can have definite, if incremental, impacts on a streetscape. Now we finally have a way to go back and see where we started and how far we’ve come.